Head and neck defects often must be replaced with soft tissue and/or bone from other areas of the body. Significant loss of soft tissue requires flaps of sufficient bulk to adequately reconstruct the defect. Pedicled myocutaneous flaps have been the reconstructive option of choice in the past. However, these flaps are often unsuitable because of restricted pedicle length. The bulk of the muscle pedicle can be unsightly and, as the muscle atrophies and scars, may tether and lead to restriction of motion. The rectus flap provides excellent reconstruction of total glossectomy defects. Proper flap design and tailoring of the flap to fit a certain tissue defect result in optimal functional and cosmetic outcomes. The limited ability to contour pedicled flaps often leads to bulkiness in the wrong location. The pectoralis major flap, with which otolaryngologists are very familiar, has a short pedicle and, therefore, limited reach. The pedicled latissimus dorsi flap has a long pedicle and can often reach the vertex but can be quite bulky and requires patient repositioning for harvest. A free myocutaneous flap is the best option for reconstructing large soft tissue defects in difficult locations such as the orbit. Bulk is placed where it is needed, and the flap can be designed and tailored to eliminate excess tissue where it is not required. Precise contouring to fit a 3-dimensional defect can be achieved. The pedicle adds minimal bulk and can be tunneled more discreetly than that of a pedicled flap. The rectus abdominis flap is favored for this application because of its ease of harvest and reliability. It has been used extensively as both a pedicled and free flap for breast reconstruction. It can be harvested as a muscle-only flap or as a myocutaneous flap. 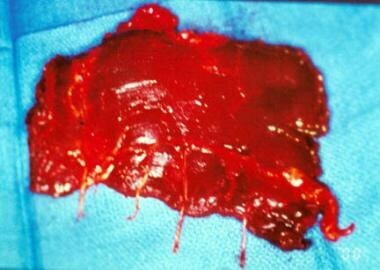 The muscle can be skin-grafted if the subcutaneous tissue is excessive for the defect size. The pedicle is of adequate length for anastomosis in the neck or temporal region. Blood supply to the skin depends on perforators from the underlying rectus muscle; therefore a cutaneous free flap without muscle cannot be harvested. For decades, the rectus abdominis flap has been used to reconstruct breast defects, primarily as a pedicled flap. The advent of microsurgical techniques has allowed this versatile flap to be transposed to repair soft tissue defects of the head and neck. The flap provides healthy muscle, with or without a skin paddle, that can be used to replace soft tissue bulk. Vascularized skin and fat resist atrophy, but denervated muscle shrinks with time. Motor reinnervation of the rectus muscle, which allows for preservation of muscle bulk over time, has been described and serves to increase the usefulness of this versatile flap. Although not optimal for small or shallow defects, the rectus flap provides the reconstructive surgeon with an excellent option to reconstruct large defects. This flap is most commonly used for glossectomy defects, orbital/maxillary defects, and (as a muscle-only flap) skull base reconstruction. Head and neck defects often must be replaced with soft tissue and/or bone from other areas of the body. Significant loss of soft tissue requires flaps of sufficient bulk to adequately reconstruct the defect. Proper flap design and tailoring of the flap to fit a certain tissue defect results in optimal functional and cosmetic outcomes. The routine preoperative evaluation includes a full history and physical examination. Routine laboratory studies, a screening chest radiograph, and a CT scan and/or MRI are obtained as required. Consultations with appropriate specialists are included in the assessment. Evaluation by a speech therapist is usually indicated. Consider a consultation with a dental and/or oral surgeon prior to surgery. Examination of the abdomen and groin for evidence of previous surgery must be performed. In female patients, consideration of parturition is a necessity because delivery may change the vascular anatomy to the skin. Rectus abdominis free tissue transfer allows for transfer of a large vascularized segment of skin and muscle from the abdominal wall to its intended recipient site. Patients in whom other flaps would be too thin can benefit from this flap. As a muscle-only flap, it has become indispensable for reconstruction following skull base surgery. As a myocutaneous flap, it is particularly suitable for reconstructing partial and total glossectomy defects (see the image below). Motor reinnervation is possible to maintain bulk (see the image below). Motor innervation of the rectus flap is possible. Motor nerves to the rectus muscle are displayed here. A suitable recipient nerve (eg, CNXII) should be identified, and microneural techniques used. Fat volume is well preserved in a denervated free myocutaneous flap, but it loses muscular bulk with time. Preservation of bulk can be of functional benefit in the glossectomy patient. Sensory reinnervation has also recently been reported. The ability to identify a sensory nerve for anastomosis in the recipient bed would greatly benefit the glossectomy patient. The rectus abdominis muscles are paired, vertically oriented muscles that are components of the abdominal wall. Superiorly, they attach to the rib cage. Inferiorly, muscle fibers extend to the pubis. They are divided into segments by tendinous inscriptions. The rectus sheath, formed by fascial extensions of the internal and external oblique muscles and transversus abdominis muscle, encases the rectus muscle. The lateral boundary of the rectus sheath is known as the linea semilunaris, and, medially, the linea alba separates the 2 rectus muscles. Above the arcuate line, the posterior sheath is formed by the fascial condensation of the transversus abdominis and the transversalis fascia. As such, the anterior sheath can be removed with relative impunity because closure of the posterior sheath provides sufficient structural support to prevent abdominal herniation. Because musculocutaneous perforators to the skin paddle pass through the anterior sheath, this layer must be harvested beneath that portion of the skin paddle overlying the muscle. Below the arcuate line, the posterior sheath is only composed of the transversalis fascia, which is not strong enough to prevent hernia formation. Approximation of the anterior sheath or use of mesh is required to prevent a hernia from occurring in this area. Vascular supply to the rectus is via the superior and deep inferior epigastric vessels. The deep superior epigastric vessels are not used as the pedicle for the free flap because it is of smaller caliber than the inferior vessels and a greater amount of skin can be harvested with the inferior system. The superior pedicle provides the blood supply for a pedicled flap used for breast reconstruction. During harvest, the pedicle is identified in the inferior portion of the muscle on its lateral aspect. Usually, one vein is harvested with the artery. The skin of the myocutaneous flap is vascularized through musculocutaneous perforators, which are of highest density in the periumbilical region. This area is incorporated into the flap whenever possible in order to incorporate these vessels and optimize skin vascularity. Contraindications for a rectus abdominis flap include prior abdominal surgery in which the vascular supply may have been transected and conditions that would otherwise make the patient unsuitable for a free flap. A patient with a preexisting hernia should warrant careful consideration if a rectus flap is planned because abdominal wall strength is weakened after this surgery. Extreme obesity is not a contraindication per se, but the result may be a bulky, perhaps unsightly, flap; such patients may be better candidates for a skin-grafted rectus muscle flap or another flap from a different site. Lo JO, Weber SM, Andersen PE, Gross ND, Gosselin M, Wax MK. Atelectasis after free rectus transfer and abdominal wall reconstruction. Head Neck. 2008 Oct. 30(10):1339-43. [Medline]. Ireton JE, Kluft JA, Ascherman JA. Unilateral and Bilateral Breast Reconstruction with Pedicled TRAM Flaps: An Outcomes Analysis of 188 Consecutive Patients. Plast Reconstr Surg Glob Open. 2013 May. 1(2):1-7. [Medline]. Cappiello J, Piazza C, Taglietti V, Nicolai P. Deep inferior epigastric artery perforated rectus abdominis free flap for head and neck reconstruction. Eur Arch Otorhinolaryngol. 2011 Aug 25. [Medline]. Matros E, Cordeiro PG. Single-stage reconstruction of composite central neck defects with the double-island vertical rectus abdominis musculocutaneous flap. Ann Plast Surg. 2011 Feb. 66(2):164-7. [Medline]. Kubo T, Matsuda K, Kiya K, Hosokawa K. Behavior of anastomozed vessels and transferred flaps after anastomosed site infection in head and neck microsurgical reconstruction. Microsurgery. 2016 Jan 21. [Medline]. Lyos AT, Evans GR, Perez D, Schusterman MA. Tongue reconstruction: outcomes with the rectus abdominis flap. Plast Reconstr Surg. 1999 Feb. 103(2):442-7; discussion 448-9. [Medline]. 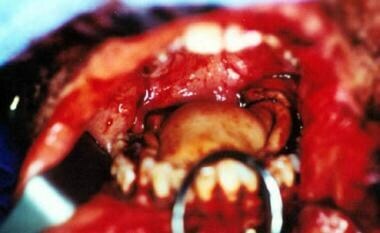 Yamamoto Y, Sugihara T, Furuta Y, Fukuda S. Functional reconstruction of the tongue and deglutition muscles following extensive resection of tongue cancer. Plast Reconstr Surg. 1998 Sep. 102(4):993-8; discussion 999-1000. [Medline]. Yap LH, Whiten SC, Forster A, Stevenson HJ. Sensory recovery in the sensate free transverse rectus abdominis myocutaneous flap. Plast Reconstr Surg. 2005 Apr 15. 115(5):1280-8. [Medline]. The rectus sheath is closed to prevent postoperative hernias. The defect is almost always closed primarily.